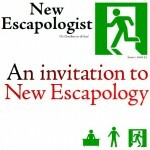 After a year out of print, Issue One of New Escapologist is now once again available. With our new higher production values and Tim Eyre’s sensational typography, the relaunch is a highly improved version of the original. The relaunch features our classic articles by Lord Whimsy, Judith Levine, Neil Scott and Robert Wringham and is illustrated throughout with new work by Samara Leibner. Buy it now at the magazine shop for the limited special offer price of £3. Robert Wringham is a humorist and the editor-in-chief of New Escapologist. A bundle of our first seven issues. Featuring minimalism, Houdini, Leo Babauta, Bohemianism, Alain de Botton, Sartre, and Tom Hodgkinson. 567 pages. £35. A bundle of our last six issues. Featuring Luke Rhinehart, Flaubert, Mr Money Mustache, part-time work, Will Self, home life, Richard Herring, and E. F. Schumacher. 593 pages. £30. Our final issue. Featuring an interview with celebrity mortician Caitlin Doughty; Matt Caulfield on zen fool Ryokan; and Reggie C. King on David Bowie and Sun Ra. 122 pages. £7. A hardback guide to scarpering. Essential reading for wage slaves and slugabeds alike. Published by Unbound. 230 pages. £12.